If you say you don’t like Spam then you are no friend of mine. Sure, I shot a lot of high end food but when you get right down to it, can you really beat super-processed meat that contains more chemicals than actual meat-like ingredients? Ok, fine, I can understand your hesitation, but seriously, if Spam is prepared properly and paired with good ingredients? Delicious. Another of the fun assignments I got to shoot last month was a quick portrait of Rob Uyemura for Sauce Magazine. Rob is the executive chef at Yia Yia’s Eurobistro in Chesterfield. Rob reviewed several cookbooks about fresh-from-the-soil produce and the creative brief was for a portait of him cooking out of one of the cookbooks. According to Rob his kitchen wasn’t photo-ready, so I ended up shooting him in his backyard grilling up some lovely ribs and some really delicious looking produce that he’d just picked from his garden. Recently I had the chance to meet local artisan Jermain Todd, who I photographed for Sauce magazine. Jermain owns Mwanzi, an eco-friendly design-build-supply firm. Among other things, Jermain makes really excellent furniture out of local wood, whether it’s reclaimed or trees he acquires from people around town who need to cut them down for whatever reason. You’ll be able to eat on some of his tables at the new Pi in the Mercantile Exchange downtown. I met up with Jermain at another small business, WunderWoods in St. Charles where he was going to pick up the wood for the Pi tables. Jermain is a cool guy, the type of guy you want making your furniture for you – the shoot was a lotta fun. I always seem to start my blog posts these days with some sort of comparison of my old life in New York City versus my current life in St. Louis. The reason this happens, I suppose, is that things really are different in a my two cities and I’m constantly amazed as I discover new things here in St. Louis that I had no idea could exist. For example, independent restaurants that happen to be located in strip malls. I’m not talking about Olive Pit, Deep Fried Lobster and TGIFUs. I’m talking about independent restaurants that I would never know existed if it wasn’t for the magazine assignments that have been taking me far and wide all over St. Louis City and County. One great example of unexpectedly good strip mall cuisine is Korea House (otherwise known as Hangook Kwan) in Creve Coeur. In a strip mall? Check. Zero ambiance? Check. Amazingly delicious and relatively inexpensive Korean food? Check. Korea House has some amazing beef bulgolgi, which is a personal favorite of mine. After I photographed the assignment for the magazine, I dragged Dr. Fiance and some of our friends out there for dinner. 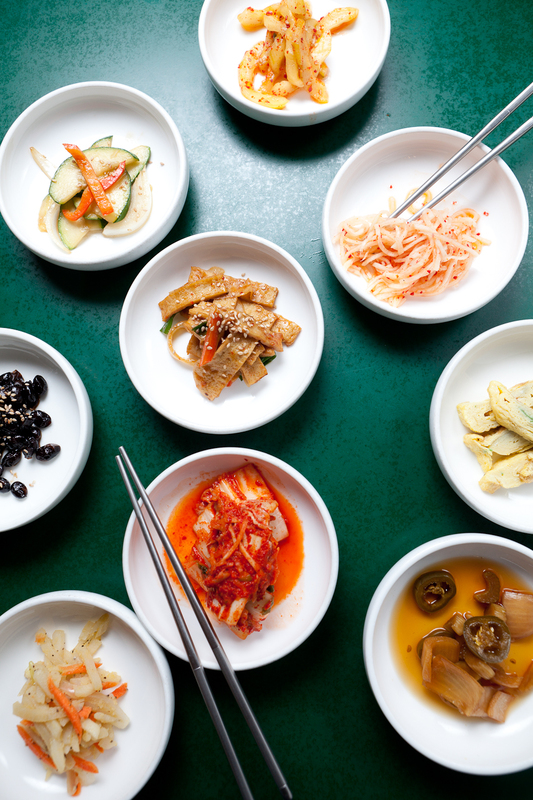 Each meal begins with a wide selection of banchan (appetizers) like fish cakes and kimchi (which I love). For our main course we tried several of the Korean barbecue options (although we decided not to barbecue our meat ourselves at the table-side barbecue pits). The barbecue is served sizzling hot in cast iron dishes shaped like the animal you’re about to consume. And just to be clear? This isn’t some sort of jazzy fajita nightmare that you’d find at a chain strip mall restaurant; this is thinly sliced, intensely favored and incredibly tender barbecue. Korean Banchan at Korea House in Creve Coeur, MO. Photography by Jonathan Gayman. 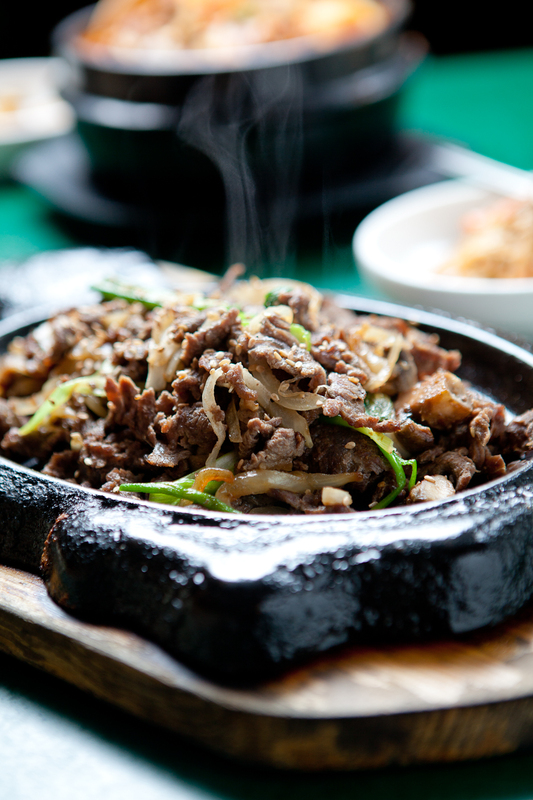 If you like Korean food, Korea House should definitely be on your list. As a final note: I had a client over at the studio for a photo session yesterday, and while we were reviewing some of the images in my office, her boyfriend noticed a print of the bibimbap photograph (above) hanging on my review board. He recognized the photo from the series in the Sauce review and told me that my photographs were the main reason he and his girlfriend decided to drive out to give Korea House a try. Always nice to hear good feedback, no?